We make your job easy and your employees happy. We know you probably have a to-do list every day that’s a mile long. Your company wants to bring in healthy food options, but you don’t want to spend much time managing the program and don’t want to hear complaints from employees about products and service. Berkshire Natural will help make your life easy and your employees happy. We work with financial, tech, and life sciences companies throughout the Greater Boston area and bring years of experience delivering healthy food programs that employees love. Fresh fruit, healthy snacks, dairy, and meals are all part of what we can offer. 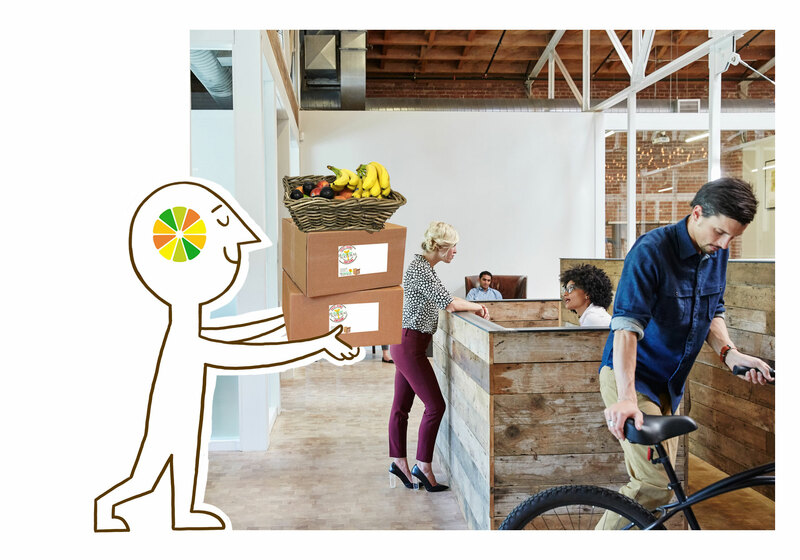 Don’t be surprised to see co-workers running down the hall — or at least walking briskly — when word spreads around the office that the our delivery person has arrived. Employees who eat healthy are 25% more likely to have higher job performance and their absenteeism is 27% lower. 74% of employees want healthy food options at work but less than half of employers provide that as a benefit. What differentiates Berkshire Natural is the level and quality of the service they provide. When something isn’t working right or employees are unhappy, I’m typically the first person to hear about it. I never get negative reports from employees about Berkshire Natural. The company ensures that everything is seamless and employee satisfaction is the number one priority. What employees respond to most is the broad variety of brands that Berkshire Natural offers; there’s always something new to try! I investigated a few snack delivery companies before I went with Berkshire Natural. I liked the focus on natural, healthy products and I appreciated the fact that we didn’t need to sign a contract. I also liked that they had a very large number of snacks to choose from at a reasonable price point. I did a lot of research into snack delivery companies before settling on Berkshire Natural. I chose them because they offer a great, cost-effective selection and have a friendly staff that answered any questions I have. Working with Berkshire has made my job a lot easier. The flexibility is the best thing about working with Berkshire Natural. They make it easy to rotate products and add new ones so employees don’t get bored having the same snacks all the time. I also like the fact that Berkshire Natural suggests products to add to the mix. Working with Berkshire Natural has made my job and colleagues’ jobs so much easier. We used to struggle and spend so much time searching for healthy options. Not only is the ordering process much quicker, but now we don’t have to unpack a bunch of boxes of snacks. The delivery driver comes in, unpacks boxes and stocks fridges and our snack closet the way we like. Our employees love the healthy snacks and fruit we get from Berkshire Natural. They can’t wait every day for when they come and make the delivery. I like how easy it is. I don’t really have to think about it. Berkshire Natural has been an outstanding addition to not only our employee offerings, but our company culture as a whole. A year later, employees still rave about all of the organic and healthy offerings, and they appreciate Berkshire Natural’s commitment to health and wellness…we always strive to maintain a great place to work, and the addition of Berkshire Natural has been an immense value to our office environment. Working with Berkshire Natural has been amazing. It’s made my job so much easier. Previously, I was spending six hours a week trying to organize stocking of three different spaces and working with three different vendors. Now Berkshire Natural handles all the stocking, and I spend thirty seconds a week. That’s huge in terms of being able to do the rest of my job. Berkshire Natural has been a godsend for us. We had been stuck with a similar company that had terrible customer service. Then, along came Berkshire. The whole team at Berkshire Natural has treated us like rock stars and we are so grateful they came into our lives. Company culture has skyrocketed because of our collaboration!